It seems that the early-mid-late designation for the Sturmpanzer has been used so heavily that it is often overlooked that there were actually 4 versions, and do to errors in some publications what the four versions are is also a bit unclear. The four models are the Series 1 (early), Series 2 (mid, I call this the early-mid), Series 3 (mid, I call this the late-mid) and the Series 4 (late). The Series 2 and Series 3 are almost identical in all aspects except the drivers port, all mid’s did not have the periscope drivers vision port only the later ones. The early-mid’s had the same driver's port as the Series 1. It often happens that a Sturmpanzer with the early drive port is automatically assumed to be a Series 1 but this is not necessarily the case. 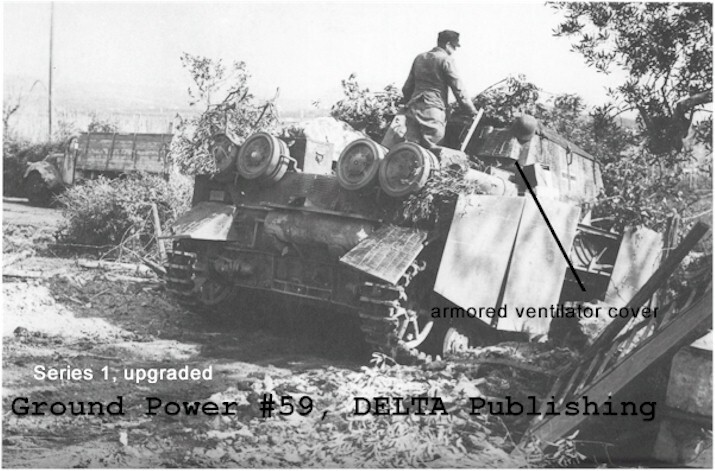 The driver’s port alone cannot be used as a means to identify the version of a Sturmpanzer. I have found no record of how many of the early-mid’s were produced, we do know that a combined 80 units of the mid’s were produced. 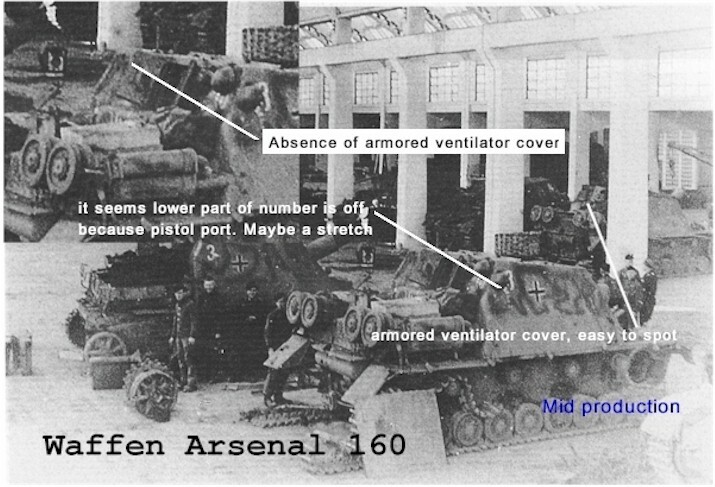 We know that 60 were produced on new Ausf. 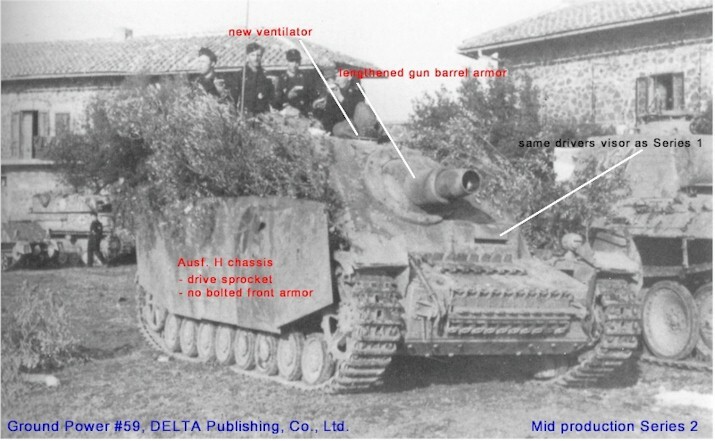 H. chassis and 14 were on remanufactured Ausf. H. and the remaining 6 were probably Ausf. J’s. 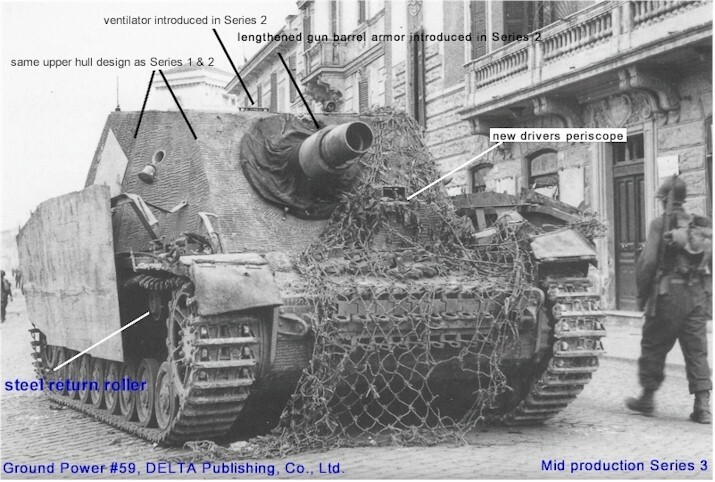 In October 1943 the 10 first new Ausf. H’s chassis were delivered to Heereszeugamt Wien in Vienna, this was the exact same month that steel return rollers and cast idler wheel was introduced into the Pz.Kpfw.IV production so it is unlikely they had these features. I am of the opinion that the remanufactured Ausf. H chassis were also delivered around this time. All photographic evidence of Series 2 vehicles seems to show the rubber return rollers so I believe that Series 2 production used these 24 chassis. At the same time I have not seen any Series 3 that did not have the steel return rollers. The next batch of new chassis delivered to Vienna was in January (50) and these would have likely had the steel return rollers; I believe these were used for the late-mid production. There is no way to be sure and this is just conjecture on my part but it seems the photo evidence will back some version of this explanation. Exact numbers of each may vary. When Stu.Pz.Abt.216 returned from Russia at the end of 1943 the 36 or so remaining Sturmpanzers were sent to Vienna for rebuilding. These vehicles were rebuilt to the specifications of the new series 2 being built. From these descriptions you can see that distinguishing a Series 2 from a Series 1 (overhauled) version can be difficult. 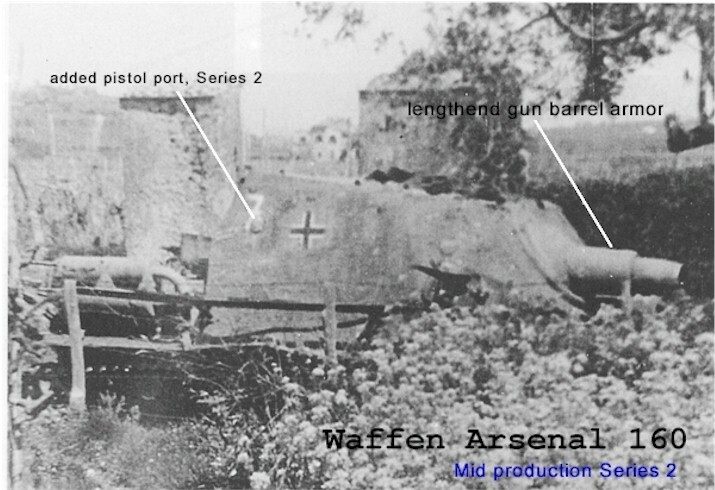 The key items to look for are chassis differences, if it’s an Ausf. H then it’s a Series 2 and besides the drive sprocket the easiest way to tell is from the added front armor. 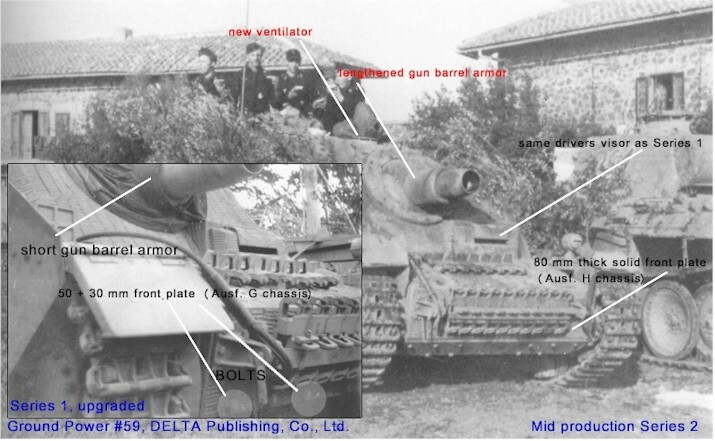 In June 43 80mm solid front plates were introduced into the Pz.Kpfw.IV chassis production so a Series 2 would not have the bolted front armor found on the Ausf G’s. This is the front plate where the spare track goes. If you cannot see the front plate or drive sprocket then the armored ventilator covers in the rear of the Series 1 were left in place so if it has them then it’s not a Series 2. 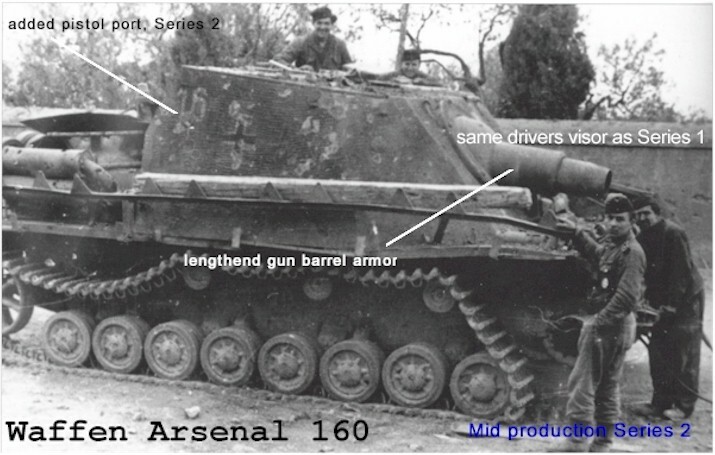 There were also new features on the Series 2 that were not on the overhauled Series 1, these were added pistol port on each side of the rear-side of the superstructure and the lengthened gun barrel armor. I would highly recommend the J.J. Fedorowicz book Sd.Kfz. 166 Sturmpanzer “Brummbar” by Markus Jaugitz, it covers only Series 1 and Series 2 Sturmpanzers but he very clearly explains the differences of the models. There are also a lot of photos in this volume.